Joan Levy has been surrounded by gourds since retiring from teaching. She loves growing them, hardening them, cleaning them, and finally feeling and looking at their unique shapes until they emerge in a new form. 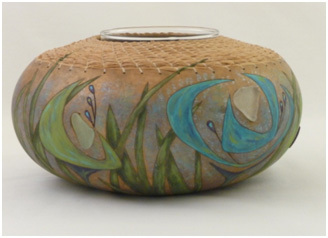 She uses a combination of wood burning, staining, painting with acrylics, carving, and basketry for design. 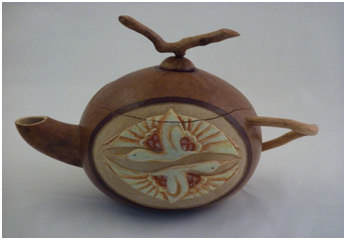 Her gourds have transformed into vessels, lamps, vases, candle holders, shakerees, boxes, teapots, and bowls. Joan has played with different art forms her whole life and is mostly self-taught. She was able to take a year off from teaching to take art classes at Greenfield Community College.